I was told my review would happen on July 20 and I went away thinking, “thats not too bad.” I can have my house torn down and shovels in the ground before September. Guess how that is working out?? Almost immediately I was impressed with the speed at the City – not the results – just the speed. Two weeks after my application was taken, I received a letter from the city with a copy of a covenant I had to sign that the city would register against my property. 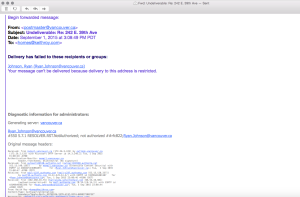 The covenant says that I promise to never subdivide my laneway house from main house – even if the city allows it in the future. I couldn’t find any notice of this on the website and wrote about it being another tax in my previous posts. It cost me $85 to register the document, in addition to the $50 I had to pay to get it notarized. But, I was pleased with the progress and knowing that the city had my documents in the cue. The 3rd week after intake, I got a phone call from someone at the city telling me that my addresses had been assigned for the 3 residences (House, Laneway and Basement Suite). Now I was really excited…..could this actually be going according to plan? Then, on June 29 (2 months later) things started to go downhill for me. The Hazardous Materials Report submitted with this application indicates further investigation is required to complete the assessment. The final report is due prior to permit issuance. If you have the final version, please submit by email for review. The problem here is that the additional investigation required is rather invasive to the house. If I had known permits were going to take so long, I would have rented the house out to recover some of my costs – like the full property taxes I am paying for a house that consumes no water and produces no garbage. Or the interest cost of the giant loan I have. However, I was happy with the speed at which things were moving so I went ahead with the 2nd hazardous materials test which required pulling up linoluem and drilling holes in the wall – making it basically un-livable. And, because I had decided to do the testing in 2 phases, it cost an additional $200 in testing and labour. At this point, Asbestos has been agitated, there were holes in the walls and the floors were ripped up. The house was un-livable. After submitting the report on July 6 the environmental review for my project was cleared Rosalie at the City of Vancouver. Everything was shaping up nicely for my July 20 review. Trying to be patient, I waited until July 10 before phoning to find out where my permits were at in the process. 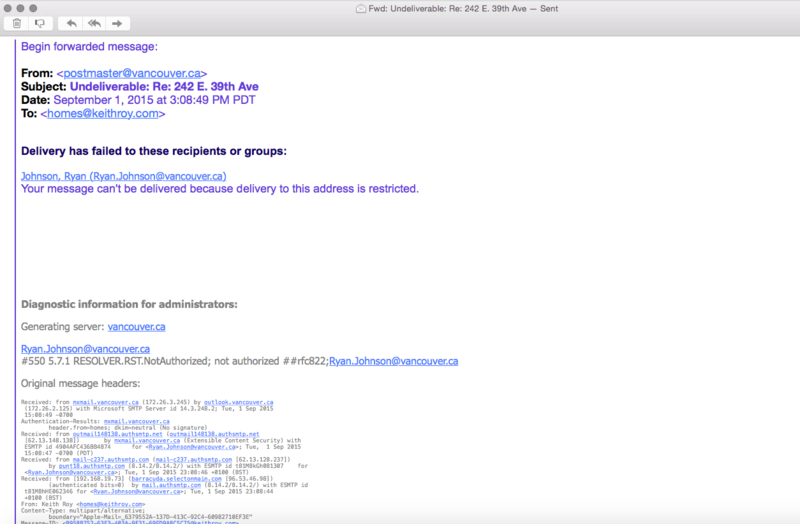 I didn’t want be pushy so I phoned the enquiry centre at the City of Vancouver. I asked them if they could track my progress and they asked for my permit number. I said I didn’t have one but could give them my address. They told me they don’t track it until it has a permit number. How do you know where in the process my house is if you don’t track it prior to me getting a permit issued. No wonder nothing ever gets improved. They don’t actually track this stuff. How long does it take for my permit to be issued? Wanting to know the real story, I went to the one person I knew could answer my question. The supervisor of the planning department is a delightful woman who is arguably the most responsive person at the City. I don’t want to email her for everything, but she is the only person who can get answers. 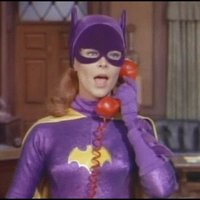 I think of her email account as the “Bat Phone” at the Planning Department at City Hall. It gets things done. This may or may not be a picture of Sonia at City Hall. Sorry to bother you, but yours is the only name I keep getting (from enquiry centre, planners, etc). I am trying to mitigate some of my risk of owning a vacant home (media reports) and plan a summer vacation and would like a clearer picture of when I can expect my permits. When I first called in the spring, I was told it was about 2 months. When I was accepted at intake from a plan checker in late April, I was told it would be mid-July (2.5 – 3 months) and when I phoned the enquiry centre today to check on my progress I was told it would be 6 months from when I dropped it off. I hope you can shed some light on the process for me and where I’m at. Your plan review was originally scheduled to be done July 20th, however due to the volume of permit applications we’re behind schedule by approx. 4 weeks. We have been doing overtime and xtra work to catch up, so I expect to get your plan check earlier than Aug 20th, I just cant give you a firm date at this time. You can expect to hear from me in August as soon as the plan review is complete. Your plans are still being held in priority order. Did you see that last sentence? Your plans are being held in priority order. I scoured the City of Vancouver website to find out what priority order is and found nothing. Because ITS NOT A THING! My plans are actually just sitting there…not being worked on. So, it looked like I was going to wait another month, which was still not the end of the world. I could still have the review by August 20 and start digging in early September. I have received your project for review and have cleared the main house DBXXXXXX. The cleared and stamped drawings have been returned to Ryan Johnson for his review and coordination. The Lane Way House application DBXXXXX has been put on hold. There are several items missing from the site plan and the details for the fence, location of the garbage and recycling and detail of that structure need to be prepared. I will talk with the PC and write you a separate email about the outstanding items to be revised. Please find attached the tree protection barrier sheets for the construction of the barriers. These must be built, inspected and approved prior to the issuance of the demo or building permits. A tree removal permit has been prepared for the removal of the standing stump and the other tree. TR 4XXXXX has a fee of $251.00 owing. The TR can be paid for at the same time as the other permits. It can’t be issued separately and the trees must remain until you have this permit in place and it must be posted visible from the street on the day the tree and standing stump is to be removed. Two Part one schedule d replacement trees are required for this Tree removal permit plus one part two schedule d tree for the lane way house. The trees must be a minimum 6 cm caliper or in some cases 3.5 meters in height depending on what has been selected. So, in 4 days I went from “priority order” to “on hold”. Awesome. The issue of laneway house landscaping is a tricky one. There is no clear explanation in the application documents and none of the landscape architects I called off the list the City gave me knew anything about laneway landscape requirements. There were all, however, very willing to take my money and charge me while they learned the process. So, we just went off what the application documents said and hoped for the best. I am sure we will be able to work out a plan for the laneway landscaping without the assistance (or added cost) of an unexperienced landscape architect. We went ahead and built the tree barrier as prescribed by the city and then submitted our results. Someone was dispatched to the property to inspect and left a hand written note on a City of Vancouver card at the door saying APPROVED! At this time, there was still hope that my house could be permitted prior to August 20, as promised in the project coordinators email. “Impossible” you say? There is no way he can would get his permits before August 20th. Well, guess what? You’re right. I still don’t have them. But, I did find out what “priority order” is. After the August 20 date came and went, I exercised restraint and waited before inquiring on progress. Wondering how things are progressing with my plans at the City? I heard from landscaping that my tree removal permit was approved, but I couldn’t do anything until the rest of it was sorted. Last I heard we were expecting a response Pre-August 20. Looking forward to getting started! Yes that is bounce back from my project coordinator. Delivery has failed. No notice was sent out. No indication that Ryan was moving departments or leaving the city. And certainly no indication of who is responsible for my project now. Priority order actually means, “I’m leaving the City”. I phoned the number at the bottom of the email and a woman answered the phone. Keith: Hello, is Ryan Johnson there please? CoV: I’m sorry, he’s left the city. Keith: Oh, do you know who is looking after his files? CoV: No, I’m new here. I’ll have to ask the supervisor. What is the address? Keith: (I gave her the address) Is Sonia the supervisor? Keith: I’ll ask her. Thank you for your time. I forwarded Sonia the bounce back email and asked who was in charge now. Later in the day, I got this email. I have your application sitting here on my desk and the review has been completed. There are a series of deficiencies that need to be corrected prior to issuance. I will forward the application to an available PC who will notify you before the end of the week regarding the list of outstanding items. Again, the bat phone got things done! In my experience Sonia is the most responsive and capable person at City Hall. As promised, later in the week a project coordinator sent me a list of deficiencies that we needed to rectify prior to permit issuance. 3. Bay windows are not acceptable as shown. A min 18” projection is required and the projection cannot start from the adjacent wall; the window must be set back a min of 18” from the corner of the adjacent wall – typical. 17. Reduce the peak height, as it is over by 10”. I would comment on this list but I really have NO IDEA what most of it means. Antonio will spend a few hours editing the plans to make sure they comply. There are other deficiencies that we will have to rectify on the Laneway House as well. I am hoping we are almost ready to go and can have shovels in the ground by the end of September. The amount of deck space allowed on houses in Vancouver is very limited. Don’t plan on having a great deck. And certainly don’t plan on covering it. Any deck space that is covered will go against your inside living square footage allowance. Any ceiling that is vaulted over 10 feet starts to count against 2 times as much square footage. Even if you have an exterior peak that goes over 10ft and all you want to do is make the interior ceiling line up with the roof line, the extra space will be counted against your living area. Tame you vision and crush your dreams. As for my new house, I hope to update you in the next two weeks about our progress with deficiencies and permits. Thanks for updating! Question, how do you know who’s your project coordinator? Wow I hope u get your permit soon as we are exactly three months behind u and we were given an October review date. Interesting question. Mine was the guy who was there the day we submitted. Now, it is someone else who is new on the scene. So, I don’t know. Seems to just be the luck of the draw. I learned that the City has recently hired 6 new project coordinators to replace several project coordinators who resigned I guessed due to over worked, bored and stressed out . That means add 6 more months of delays for them to learn how to review the plans, building and zoning by-law, new energy requirements plus practice how to deceive applicants. Keith I feel your pain. One of the many things I find frustrating dealing with the city is the limitation on outdoor space. Given the high price of housing most don’t have the luxury of having as much finished area as they would like. Relaxing outdoor space requirements would go a long way towards improving livability if people were allowed to have more outdoor space. It certainly doesn’t add density to a home or neighbourhood. I guess the city is worried that all decks will later be enclosed. However I would be willing to sign a covenant guaranteeing this would never happen . Good luck with the approvals. Your experience is all too familiar. We applied to demolish and rebuild a single family home on our existing lot (no laneway house and under the old building code rules) last December, as mentioned in a previous comment. We received our initial feedback in a “prior to” letter last April, after a 4-month wait that was only supposed to be two months. Sounds like you are at this stage right now. Back then, we naively thought we were seeing light at the end of the tunnel. Sadly we were mistaken. Our “prior to” was over 8 pages long but mostly nick-picky stuff and our designer said this was very normal. Nothing was a major issue for us or him, however, for one reason or another, it took him 6 weeks to revise and resubmit our drawings. We then sat back a waited. We were told four weeks to get a response to our resubmission in June. You can guess what happened next. Nothing. So I started calling and calling and emailing, just like you. Our original coordinator went on Mat leave. The person replacing her then went on holiday. She was overloaded when she returned so we were passed along to another coordinator. He did a few things then passed us along to a junior coordinator (one of the new hires I think). Turned out everything had cleared within the expected 4-weeks, except for landscaping. I contacted the landscaping reviewer directly and after some begging and pleading she agreed to review our revisions and provide feedback. She came up with 6 or 8 points more to fix, some of which were things she missed on her first review in March and was just spotting now in July. We made all the required changes and dropped off revised drawings just a few days after getting her comments. Now, do you think she cleared our plans? No, she did not. She confirmed that we met all her requirements but still she would not clear our plans until it was our turn in the backlog queue. I asked how long that would take and she said about 4 weeks more! So we waited 4 weeks while our file sat gathering dust on her desk. After 4 weeks I called back to inquire as to what was happening. She apologized for having forgotten all about us and promised to review our plans later that week. Two weeks later we were told by our PC that Landscaping finally cleared our plans. However, the building plan checker had yet to clear our file. It’s now September and we have been told it will still take another 3 weeks or more before we’ll get our permits, so our wait looks like it will be 10 months. I hope yours is shorter but I’d be surprised. In the meantime we’ve moved out and our house is sitting vacant. Too bad. I’m sure there are a lot of people in Vancouver who would like a place to live, even if it’s short term. -It ain’t over until it’s over. Similarly, as long as your file is open, they can go back anytime and find something deficient that they missed on the first or second reviews and make you fix it. Doesn’t sound fair, does it? It’s not, but why would it be? -It seems that Landscaping Reviewers are creating a good chunk of the backlog. I calculated ours contributed about 10 to 12 weeks additional delay over the time taken by the other reviewers. -There is a mysterious queue system. I was told we applicants are all assigned a priority sequence, based on a number of factors relating to when we apply and also how quickly we respond to city feedback. However the system is not transparent. They never tell you where you are in the queue. They make it so you can’t compare your wait times with anyone else’s. I imagine this system is open to abuse. It’s pretty easy for a reviewer to lose your file on their desk if they don’t like you and then just say it’s not your turn yet. It’s not like we’ll ever know if that’s true or not. -The queue system is creating a bigger backlog than necessary. If someone with a simple and straightforward application is stuck in queue behind someone with a messy and complicated application, they both have to wait approximately the same time. If they would clear the people with the simple applications promptly instead of just sitting on their applications, the backlog would shrink dramatically. This is basic management 101. -With mat leave, vacations, stress leave, people quitting, etc., etc., expect your file to get passed around a lot from person to person. Each time, things will misplaced or get lost in translation. They will ask you for things you’ve submitted month prior or raise issues that were resolved long ago but they do see it in the email threads. They’ll tell you you’ve done something wrong even though you just followed some previous person’s instructions. All this just adds to the excessive delays. I say good luck to all who choose to endure this bureaucratic torture. You’ll need it. Oh and regarding the Hazardous Material Survey report, our experience was similar as well but perhaps worse. In fact, we had the same Environmental Protection Officer. We originally paid $2,300 for a survey, which included 25 samples (mostly for asbestos). Only three of the samples tested positive, so it’s not like our house was riddled with asbestos. Rosalie, flagged our report as deficient and contacted WorkSafe BC who sent inspectors to our house for a two hour site inspection. They forced us to take an additional 73 samples, for a total of 98 samples. Only a couple of these samples were positive for asbestos and the sampling required making holes in every surface of every room in our entire house, as well as the exterior. The cost to us for the second survey was $4,800. That’s $7,100 in total for HAZMAT testing. This does not include the cost of any Asbestos removal, which I now have quotes for and will be about $14,000. Oh, and at one point in this process, our coordinator claimed we had not done the second round of testing because Rosalie had not cleared it off the system, even though it was submitted to her months earlier. It took a week just to sort out that particular mix-up. We are 24 months into a project that was supposed to take less than 9 months. The arrogant disregard for the people they are paid to serve is astonishing. Our story would fill a novel. My sympathies to you as you head through this process. It will test your patience, your resources and your faith in the city you have chosen as home. There does not seem to be any impetus to change. I feel the pain of all of the above responders having worked on several new housing permits myself. If any other business ran theirs the way the City of Vancouver runs the development department they would be OUT of business. The systems are not at all efficient, the staffing is insufficient, and the timelines are beyond unacceptable; not to mention that the new building code has just exacerbated everything. Hi Keith, any updates? I hope u already got your permit.